British Shorthair is the descendant of cats which have been brought to Britain by the Romans and then interbred with cats who already inhabiting the island. Later, they crossed the breed with Persians to improve the density of the hair. Breed has been recognized in the 19th century, and the British Shorthair was presented in 1871 at the exhibition “Crystal Palace cat show.” The popularity of the breed declined until 1940, but after World War II an intense breeding made it popular again. British Shorthairs have a dense, thick, “plush” coats, the eyes are large, round, widely set and in different colors (depending on the color of the coat). Their heads are round, with full, chubby cheeks. Body is large and muscular. The breed has a broad chest and shoulders, short legs, round paws and a plush tail with a blunt tip. Their relatively small ears with rounded tips are set far apart. They have pert snub noses and slightly rounded chins. Males in this breed are larger than females. An adult male weighs on average between 5 and 10 kg, whereas an adult females weighs between 4 and 7 kg. The typical lifespan of this breed is between 14 and 20 years. British Shorthairs come in many colours and patterns. For many years, the more popular blue variant was common enough to have a breed name of its own: the “British Blue”. It remains one of the most popular colours, though there is now a large variety of other colour and pattern variants accepted by most feline governing bodies and associations. These include the colours black, blue, white, red, cream, chocolate, lilac, cinnamon and fawn. British Shorthairs can be bred in “self” or “solid”, which are all one colour, as well as the colourpoint, tabby, shaded and bicolour patterns. All colours and patterns also come in the tortoiseshell pattern, which is a combination of red and cream with other colours. British Shorthairs have a stable character and take well to being kept as indoor-only cats, making them ideal for apartment living. Kittens are very playful, but an adult cat is not terribly demanding of attention, though they will let their owner know if they feel like playing. They are not a very vocal breed but will meow to communicate with their owners, for example when they are hungry and their food is being prepared. British shorthair cats are very attached to the owner, they will follow you as they are curious and like to watch what you are doing. Some do not mind being cuddled, but most prefer to keep four paws on the ground and be patted rather than picked up. 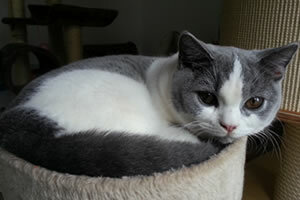 British Shorthairs do not require a lot of grooming as their fur does not tangle or mat easily. However, it is recommended that the coat be brushed occasionally, especially during seasonal shedding, since they may develop hairballs at this time. British longhair is a sister breed of british shorthair breed. British longhaired cats have same standard and phenotype as british shorthair cats, just the lenght of a coat is different – long. Care of british longhaire cat is a little bit more demanding, it requires combing and brushing every 2 to 3 days.